Love, romance, Paris… This is exactly the impression we get from a gorgeous interior created by a famous Parisian designer Stephane Olivier. It’s harmonious from top to bottom: colors, finishes, furnishing, combination of different epochs and styles… This is a visiting card of Stephane; he permanently strives to obtain the golden mean in mixing past and present, unique pieces of furniture and home décor. It seems like this interior was created for a happy and wealthy family couple with a good taste. Perhaps, he is an elegant, handsome and successful banker. She is a romantic and tender psychologist. They are about 50. 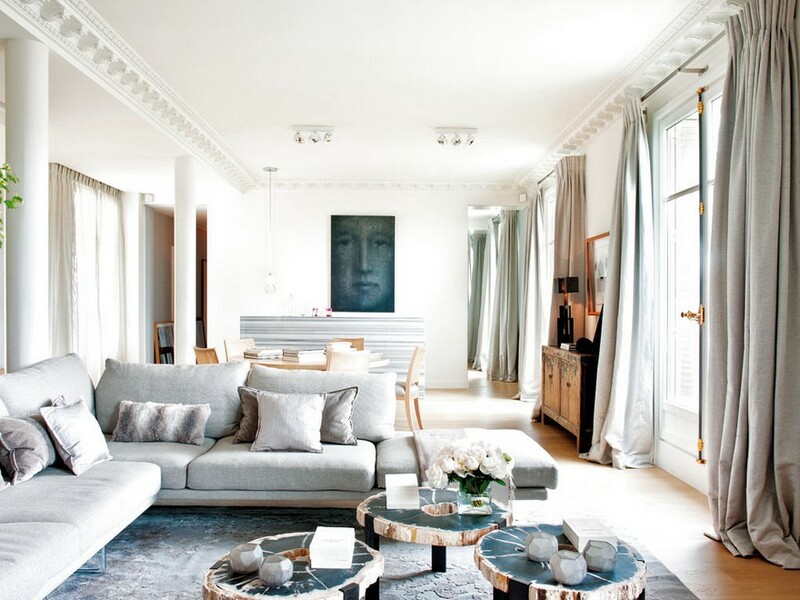 Their feelings are getting stronger over the years, like a good wine, and hence the interior appears to be very solid, with top-quality designer furniture and luxurious pieces of décor. 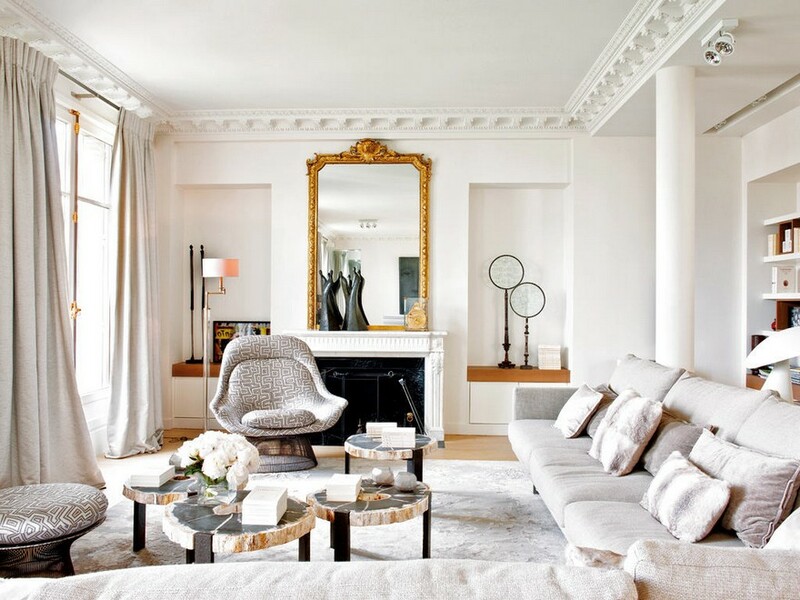 Mirrors dressed up with golden frames add a touch of glamorous chic to the atmosphere. Romantic spirit is created by soft light hues and smooth shapes in furnishing and finishes. 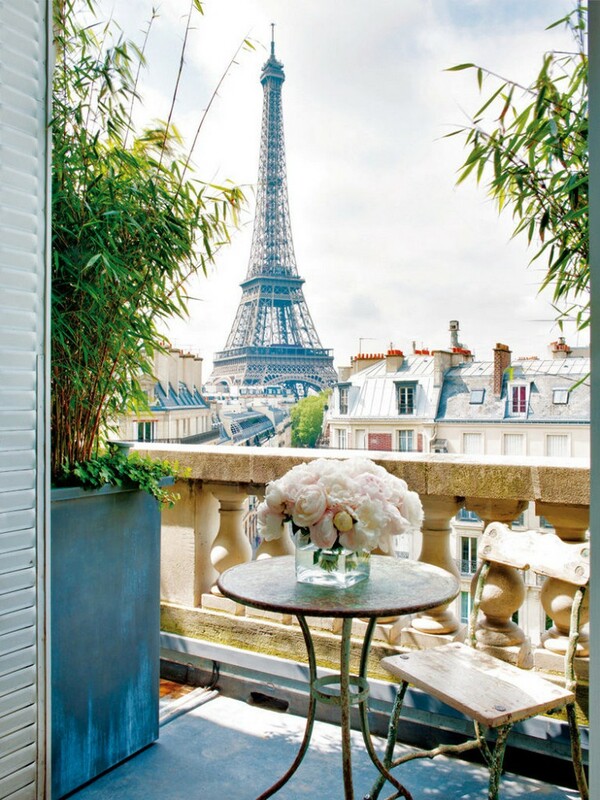 This impression is enhanced by a gorgeous view of the Eiffel Tower opening from the window. 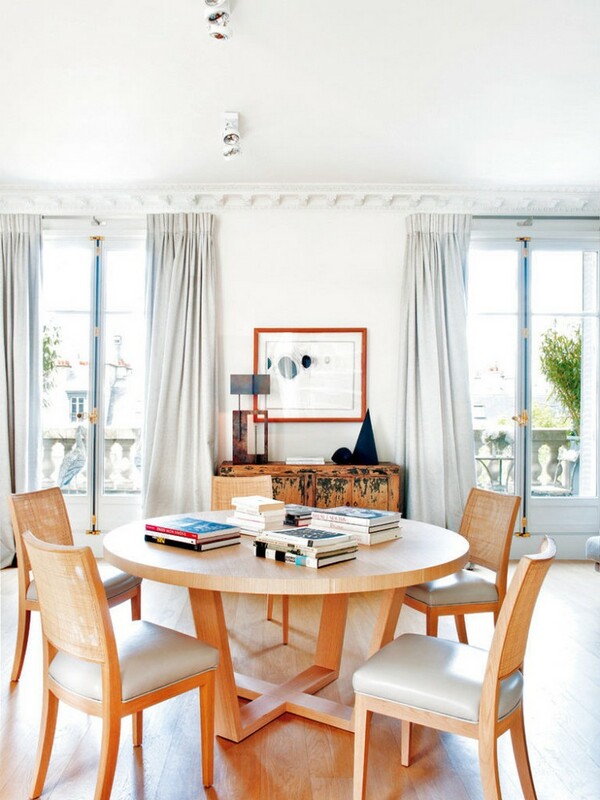 A small balcony is furnished with designer furniture in the style of 19th century from Stephane Olivier’s collection. A delicate bouquet perfectly blends with cold marble and warm wood. It’s pretty simple to feel love in this air. Plenty of flowers, indoor plants, artworks, butterflies and just beautiful decorative details are clear features of romantic interiors. And the bedroom is the most romantic space in the apartment, of course. One more detail that deserves a special mention is that in this interior you may notice a great harmony of feminine and masculine mood: soft and smooth lines are found next to clear and straight shapes, sophisticated chairs look great in the company of massive chandeliers, moldings and columns. Relaxing mood of the lounge zone is created by an elegant and delicate couch by the window and a soft rug made from the wool of Mongolian sheep. And a marble table put on a marble floor part brings a finishing touch of art-deco to the composition. Thanks to big windows and absence of interior doors, the apartment is filled with airiness and sunlight. There’s no doubt that the hosts love each other. And they also like to invite guests to their home. For this purposes there’s a big group of seating furniture coupled with a luxurious fireplace, interesting pieces of décor, sculptures by Feliciano Bejar (Mexico), and a giant mirror in a golden frame. Columns accentuate the reception zone and visually separate it from the dining area along with a silky gray carpet. One conventional coffee table was abandoned by the hosts in favor of a group of three tables in marvelous opalized wood. They were brought from Stephane Olivier’s gallery. One more interesting detail of this zone is a Platner arm-chair with an original base and a matching ottoman. The kitchen is significantly different from the rest of the space – it’s dominated by brutal loft-style motifs, black furniture color and sharp lines. Everything is quite laconic, and it seems like the husband is someone who cooks here more often. The dining area is designed laconically, in quite neutral tones, but using pretty expensive finishing materials. The bar, for example, is made in marble. Hung above it is an artwork by Jordi Alcaraz. Opposite the table there’s an ancient Chinese cupboard with dark touches of history. 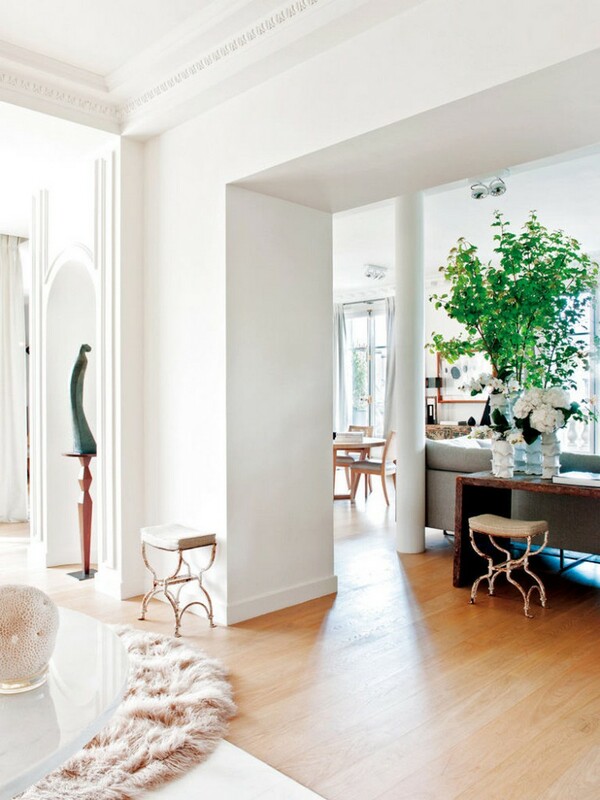 The secret of stylishness of this apartment lies in a well-structured space, colors and textures. They create a perfect background for exclusive luxurious pieces of furniture, décor, finishing materials and home textile. Every detail of this interior speaks about its premium level, expensiveness, harmony and love. Mobile Sensory Garden – What Is It?